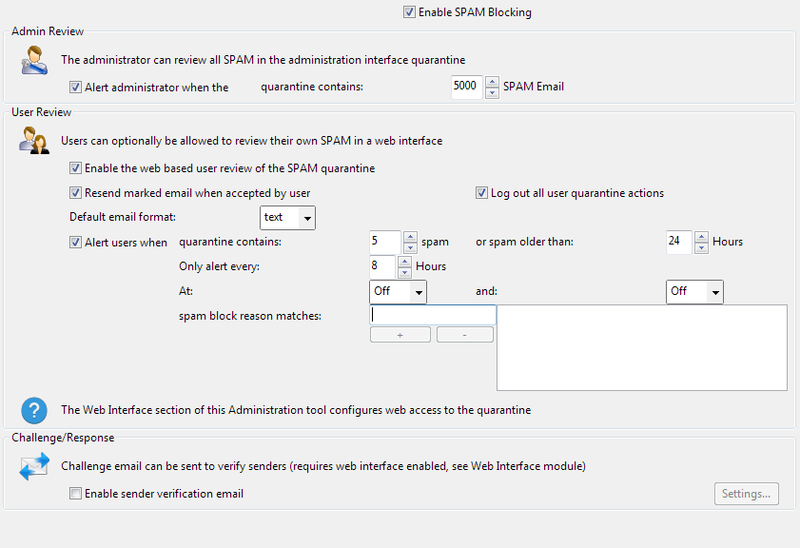 You can optionally allow users to review their own SPAM that has been quarantined using a web interface. The settings on this page allow configuration of various options controlling how the interface is to be delivered and who has access to it. You may also want to refer to the Users page to configure a set of users who have access, their passwords, email addresses and any email alias for each user. To modify the look of the interface, you need to edit the files in the Hexamail Guard installation directory under the sub directory webui/. If you are running a webserver on the same machine as Hexamail Guard it will probably be using port 80, so use port 8080 for the web based SPAM review port specified on this page. The URL specified must be such that when users click the url/link in their alert email it will take the users to the machine running Hexamail Guard, so if users working outside your LAN are to receive alert email and review their quarantined email, ensure that the URL specified resolves to the correct machine, and that your firewall has the selected port (8080 by default) open for incoming HTTP. If you enable challenge response, the sender is notified if their email is blocked, and they are invited to unblock it by entering a code. This allows legitimate senders to easily allow their email to pass through (and adds them to the recipient's whitelist) whilst preventing automated mailers from sending, as they are incapable of entering the code required. Press the Settings button to open the challenge response settings.